In the heady days of the mid-'60s the midsize muscle car was king, the concept launching competition between the Big Three’s various divisions like never before. By 1968 even Chrysler’s Dodge and Plymouth branches were at each other’s throats; Plymouth launched the first salvo when it pilfered the "Road Runner” name from Dodge’s 1967 advertising campaign, introducing the new stripped-down big block Road Runner as a 1968 model. Dodge grudgingly responded with the 1968 Super Bee, and the fight was on. Sharing engines and drivetrains meant performance was almost identical, but in 1969 Dodge engineers replaced the 440 CI engine’s single carburetor with the now-famous Holley-Edelbrock Six Pack carburetion, and added heavy-duty internals to produce 390 HP. 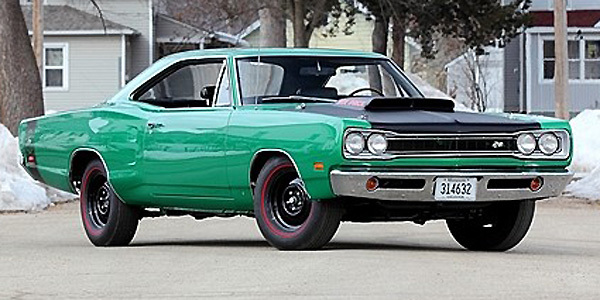 Still stripped down to its barest elements, the Super Bee nevertheless called attention to itself with a radical Back fiberglass lift-off hood held down with NASCAR hood pins and sporting a large air scoop with Six Pack callouts. Black painted steel wheels with chromed lugs and Redline tires and a wide tail stripe with Super Bee graphics added to the car’s street-fighter image.